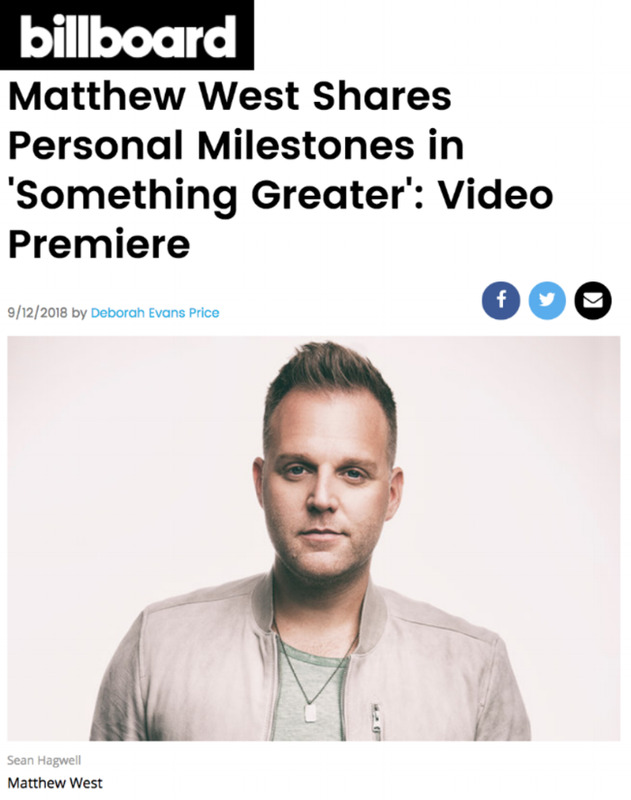 Nashville, Tenn. (Sept. 14, 2018) – Billboard.com exclusively premiered four time GRAMMY® Nominee Matthew West’s brand-new music video for “Something Greater,” recounting the singer’s personal journey to Nashville. Off his chart-topping album, All In, the video is compiled of personal clips of West from his wedding day, early career performances and with his daughters, imparting the narrative of West’s life up to this point. “‘[Something Greater]' is my favorite song on the record, because it shares more of my direct story than my songs tend to do,” shared West with Billboard. “This song illustrates a change in my creative process. A lot of times my inspiration will be deeply personal, but then as a songwriter I’ll try to reach out and grab this universal message, so I’ll take this direct inspiration, but then try to write it in a way that everybody could relate to it. That’s part of my job as a songwriter, to write relatable songs." Following "The Answer/All In Tour," a 20 city co-headlining fall tour with Jeremy Camp, West will be headlining Compassion LIVE’s “The Roadshow Christmas” and “The Roadshow” 2019, visiting 29 markets coast to coast. Joining West on the first-ever “The Roadshow Christmas Tour” are Matt Maher, Building 429, Plumb, Josh Wilson and Leanna Crawford, visiting arenas in November and December with more cities to be announced. Throughout February and March, West will be accompanied on “The Roadshow Tour” 2019 by Tenth Avenue North, Matt Maher and Leanna Crawford with worship from special guest, Michael W. Smith. The two treks will give fans even more opportunities to experience the award-winning line-ups. Pre-sale is currently available for several dates of Compassion LIVE's “The Roadshow Christmas Tour” and “The Roadshow Tour” with the public on-sale launching on Sept. 19 at 10 a.m. local time. More dates to be announced soon. For tickets and additional information, visit www.matthewwest.com.